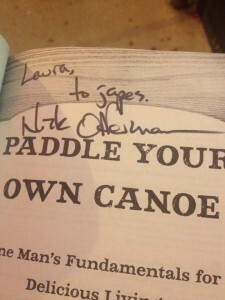 On Friday Oct. 4, 2013 the Unabridged Bookstore and the Music Box Theatre teamed up to host the incredibly funny and razor-sharp vocabulist Nick Offerman to celebrate his new book “Paddle Your Own Canoe.” As a Minooka, Illinois native this event is a homecoming for Offerman as he returns to the city that gave him his start. After attending the University of Illinois at Urbana-Champaign in 1993 he, along with his creative cohorts and fellow students, co-founded the Defiant Theatre here in Chicago. 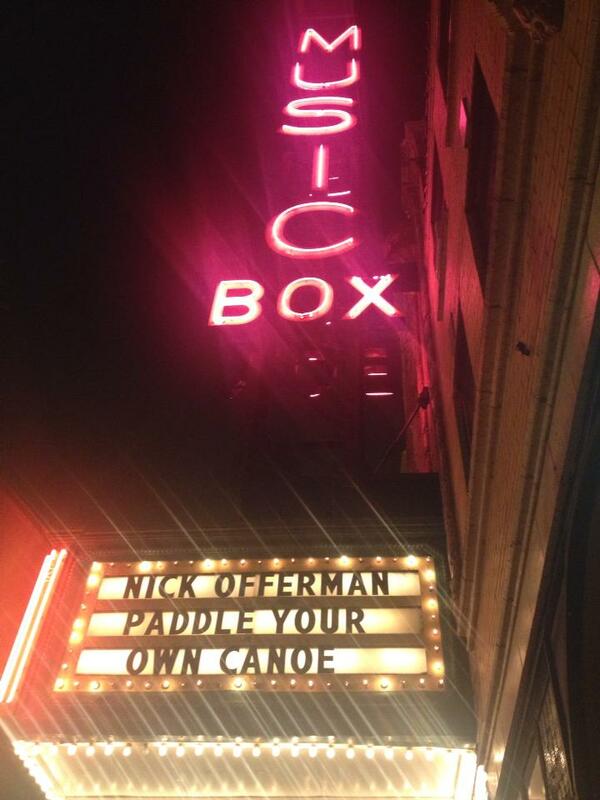 The Music Box Theatre was packed with fans of Offerman and presumably his highly beloved “Parks and Recreation” character Ron Swanson whose name, if Googled, turns up an impressive and endless supply of memes. 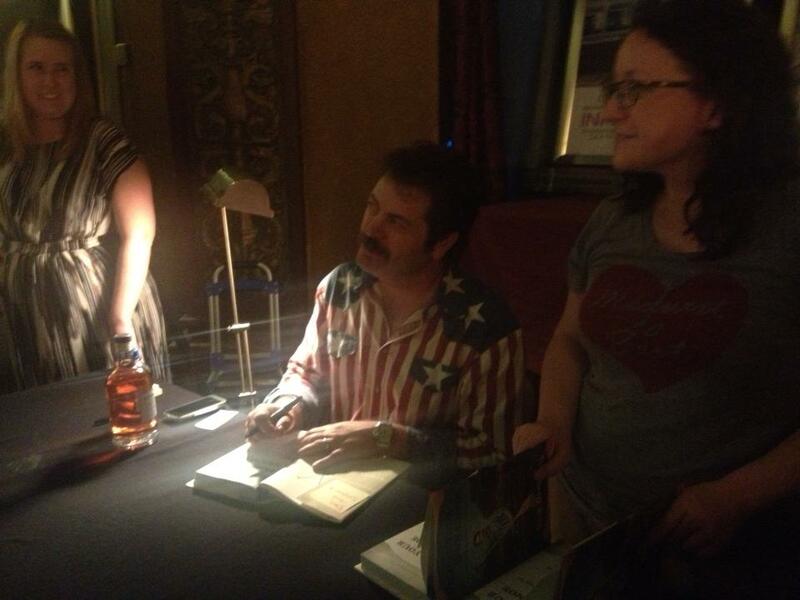 Much like Offerman’s sense of humor the tone of the evening was low-key but rich in subtleties. As a testament to his talent, though a double-edged sword, Offerman has nearly become synonymous with and indistinguishable from Swanson – and he was not remiss in mentioning this throughout the evening. The main difference? In real life he giggles more. Offerman took the stage in a casual yet patriotic getup of jeans and a denim shirt imprinted with stars and stripes. 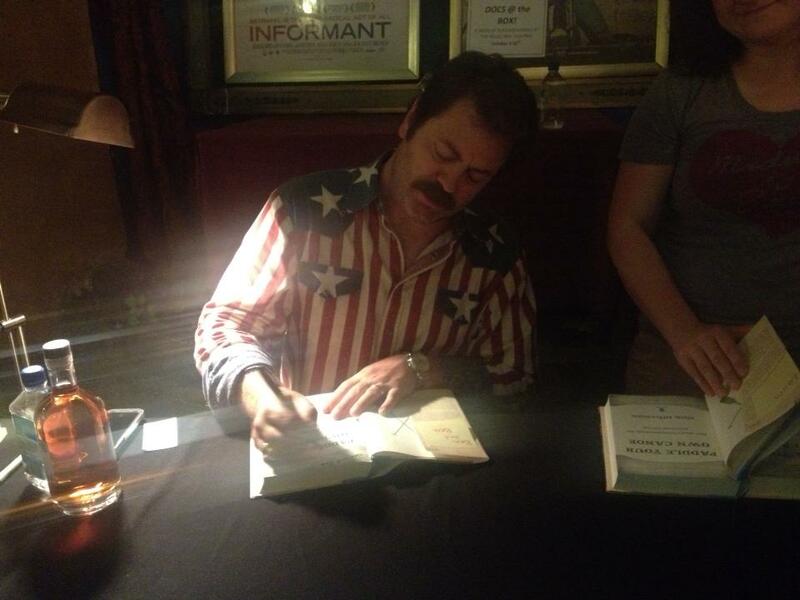 His infamous and impressive moustache was front and center. He alternated between reading excerpts from his book, playing original tunes on the guitar and professing his undying love for his wife and muse Megan Mullally. During one of his medleys, set to the tune of Johnny Cash songs, he forgot the words and, as any seasoned improv artist would do, he took out his phone and said ‘excuse me while I check my email to see if my assistant sent me the lyrics to the song I forgot; one of my assistants, the one in charge of socks and email. Nope’ and hummed his way through the gaps. The crowed was delighted nonetheless and charmed by his humility and boyish laugh. 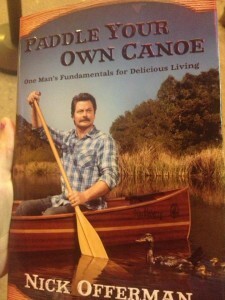 In his book “Paddle Your Own Canoe” Offerman reminisces about working in the corn fields of Minooka during his teenage years, how he thought he was going to be the next big thing in breakdancing, growing the manliest of moustaches, and the endless array of culinary possibilities when grilling meat. He also speaks out on certain topics he feels need to be addressed like the processed food epidemic. As the book’s title suggests Offerman is a ‘salt of the earth’ kind of guy, no matter how famous. 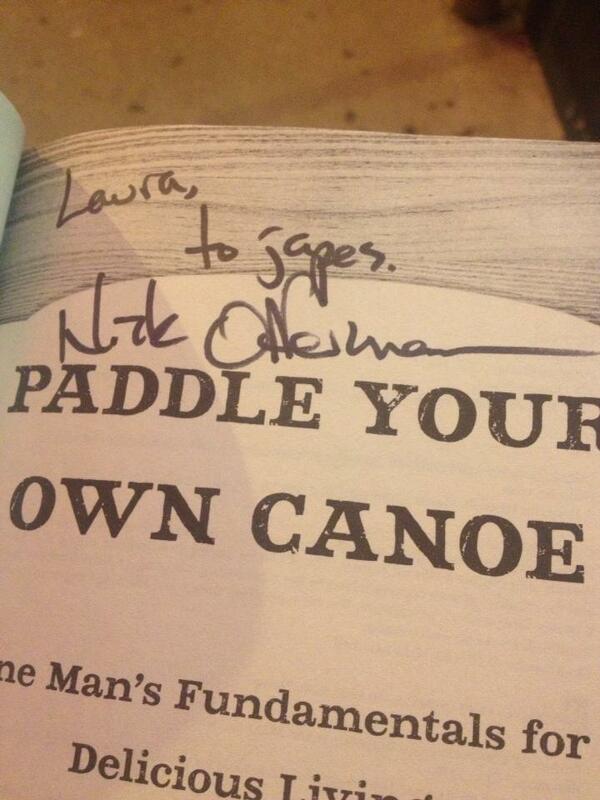 He believes in knowing where your food comes from and encourages people to get outdoors more.